3mm Bridgette Uppercase Letter Font Metal Stamp Set plus 6 flourish stamps. No returns. Weight: 1.95 lbs. Our most popular metal stamping letter font set. 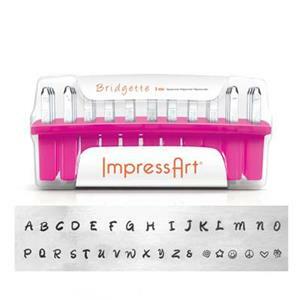 Lowercase Bridgette metal stamps set sold separately #XJ417. Features precision-cut letters on a metal stamp made from carbon tool steel. The set includes six flourish stamps and all the stamps are protected with a new oil-free coating. Notes: New box dimensions: 6.5in L x 2.5in W x 3in H Stamp dimensions are: 6.3mm W x 64mm L.
I bought this stamp set to make a stamped sterling ring, it turned out great.